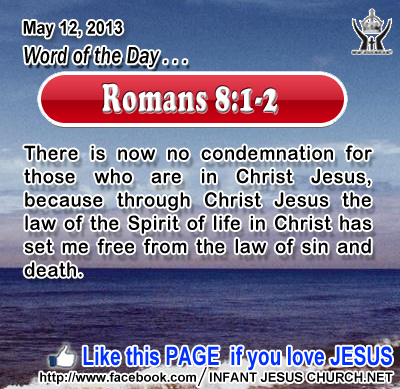 Romans 8:1-2: There is now no condemnation for those who are in Christ Jesus, because through Christ Jesus the law of the Spirit of life in Christ has set me free from the law of sin and death. Heavenly Father, thank you for all of your gifts to us. Today, we want to especially thank you for liberating us from law and empowering us with your Spirit. Fill us and empower us today with your Spirit as we commit to live our life for you. In the name of Infant Jesus we pray. Amen. 46Jesus said to the Eleven: "Thus it is written, that the Christ should suffer and on the third day rise from the dead, 47 and that repentance and forgiveness of sins should be preached in his name to all nations, beginning from Jerusalem. 48 You are witnesses of these things. 49 And behold, I send the promise of my Father upon you; but stay in the city, until you are clothed with power from on high." 50 Then he led them out as far as Bethany, and lifting up his hands he blessed them. 51 While he blessed them, he parted from them, and was carried up into heaven. 52 And they returned to Jerusalem with great joy, 53 and were continually in the temple blessing God. God's love and gift of salvation is not kept for a few or for one nation alone, but it is for the whole world - for all who will accept it. The gospel is the power of God, the power to let go people from their burden of guilt, sin, and oppression, and the power to heal, restore, and make us entire. This is the great commission which the risen Jesus gives to the whole church. All believers have been given a share in this task - to be messengers of the good news and ambassadors for Jesus, the only savior of the world. We have not been left alone in this task, for the risen Lord works in and through us by the authority of his Holy Spirit. Today we witness a new Pentecost as the Lord pours out his Holy Spirit upon his people to renovate and strengthen the body of Jesus and to provide it for effective ministry and mission world-wide. Do we witness to others the joy of the gospel and the hope of the resurrection? Loving Infant Jesus, through the gift of your Holy Spirit, you fill us with a strong spirit of praise and joy which no earthly trial can subdue. Fill us with your resurrection joy and help us to live a life of admire and thanksgiving for your glory. May we witness to those around me the joy of the gospel and the actuality of your resurrection.